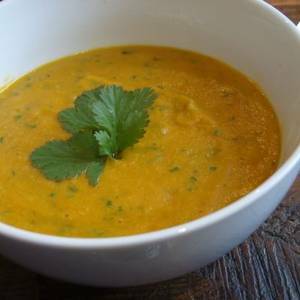 Lots of vegetables blended into a delicious creamy soup, with a great alkalizing benefit. Chop all vegetables into bite size pieces and pop into a large pot, add dried peas and cover with water. Boil then simmer for no less than 2 hours (peas are best when cooked till mushy). Remove from heat, and blend. Season with salt and pepper, and add coconut milk, Stir, then serve with parsley/coriander. 1 members have added this recipe to their cookbook. You must sign in to review this recipe. Click here to sign in. Nutritious, healthy and tasty. Easy breakfast option. Delicious and healthy take on traditional coleslaw. A healthy and lower fat versatile chilli. There are 257 calories in 1 serving of Creamy Pea & Veg Soup. Calorie Breakdown: 31% fat, 52% carbs, 16% prot. What is my Recommended Daily Intake?